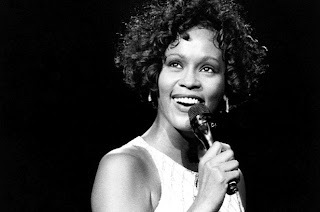 SnapCacklePop: Whitney Houston Remembered at Grammy Awards..! Whitney Houston Remembered at Grammy Awards..! On the eve of one of the biggest Music Awards of the year, the sad and shocking news broke that singer/songwriter Whitney Houston had died at 48. It was only therefore fitting, that this year Grammy Awards become a tribute to the six time Grammy Winning singer. LL Cool J opened the awards show with a prayer whilst Neil Portnow acknowledge in his telecast remarks. With only a few hour to rehearse, Jennifer Hudson paid tribute to the artist with a heart-warming rendition of I Will Always Love You, which clearly was an emotional thing to do for the singer. It was a touching performances that had us all at SCP HQ with a tear in our eye. According to CBS News, details of the singers death still remains a mystery after the singer was found in a bathtub at the Beverly Hilton Hotel.